1832- The Saint-Imier watchmaking establishment is founded by Auguste Agassiz, brother of the famous naturalist Louis Agassiz. Auguste and his two partners make and sell pocket watches with crown-wheel escapements similar to those produced by the Swiss watchmaking industry in general. 1846- Agassiz becomes head of the company. Thanks to his family contacts in the United States, it is hugely successful abroad, particularly on the other side of the Atlantic. 1852- Ernest Francillon, Auguste Agassiz’s nephew, joins Saint-Imier. This qualified economist gradually takes over the family business. 1867- The Longines factory, located in Saint-Imier – or, more precisely, in Es Longines (‘long meadows’) – is inaugurated in 1867 by Ernest Francillon. That same year, it produces its first movement, the 20A. This 20-line calibre has an anchor escapement, as well as a pendant winding and setting mechanism. It wins an award at the Universal Exhibition in Paris in 1867. 1876- Jacques David, technical director at Longines, goes to the United States for the Universal Exhibition, held in Philadelphia, as a delegate of the Société Intercantonale des Industries du Jura (‘Intercantonal Industrial Society of the Jura’). The report he writes upon his return is generally regarded as being the catalyst for the industrialisation of Swiss watchmaking, which at the time was still based on the system of établissage, characterized by a network of highly specialised artisans working independently. Thanks to Francillon’s intuition and David’s hard work, Longines is able to be a pioneer in mechanised production. 1878- With its new mechanical procedures, Longines produces a simple chronograph movement, the 20H calibre, patented by the watchmaker Alfred Lugrin. This is the first mechanism manufactured by Longines that can be used for precise timing, an area in which the brand will invest heavily from the end of the 19th century. 1881-The oldest known advertisements for products by the brand with the winged hourglass are related to horse racing. Pride of place goes to Lugrin’s patented chronograph featuring a single push-piece. 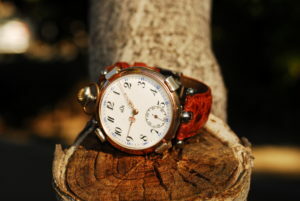 The first Longines chronographs sold in America are not only for bettors, to assist them in their assessments, and horse racing spectators, but for everyone involved in the sport: buyers searching for future champions, riders aiming to improve their performance, stud farms, and riding schools. As early as 1886, Longines is already supplying the majority of New York’s sports officials. 1888- Having laid the foundations for a production system using machine tools, Longines now becomes involved in high-precision timekeeping and produces its first movement for a certified chronometer, the 21.59 calibre. This chronometer movement is based on a calibre developed in 1878 which is adapted to improve its accuracy. 1889- Francillon takes measures to protect his business. From 1880, the brand name is filed with the Federal Office of Intellectual Property, while the logo is registered in 1889. In 1893, worldwide protection is provided when the brand name and logo are filed with the United International Bureaux for the Protection of Intellectual Property, the forerunner of the WIPO. Longines is the oldest brand name registered with the WIPO still in use, unchanged, today. 1899- Longines is associated with exploring for the first time, when it equips Prince Luigi Amedeo of Savoie, Duke of the Abruzzi, in his Arctic expedition. 1900- Longines wins the Grand Prix at the Universal Exhibition in Paris in 1900 with a pocket watch named La Renommée, containing the 21.59-calibre chronometer. Longines wins more Grands Prix than any other brand at these events. 1912- The first system of electromechanical sports timing – using wires which when broken respectively start or stop the watch – is used at the Federal Gymnastics Festival in Basel. 1913- Longines develops its first calibre for a wristwatch with a single push-piece: the 13.33Z. This movement of superior quality is 29 mm in diameter, includes a 30-minute instantaneous counter, and is accurate to within one-fifth of a second. 1916- The company begins developing shaped movements and produces a range of oval and rectangular calibres for wristwatches. 1919- Longines is named the official supplier for the International Aeronautical Federation. Longines develops highly accurate and reliable navigation instruments for use by aviation pioneers, and – through the work of Longines’ US director, John P. V. Heinmuller – times the new records set by these adventurers. 1927- US Navy officer Philip Van Horn Weems develops the ‘Weems System of Navigation’, a series of navigational devices, based on which he and Longines develop a rotating disc watch, enabling the wearer to synchronise the second hand with a GMT signal, essential for navigation: the Longines Weems Second-Setting Watch. A patent for this timekeeper is filed in 1935. 1931- Having made his famous non-stop solo flight over the North Atlantic in 1927, pilot Charles A. Lindbergh designs a navigational instrument which he has Longines bring to life. Used in conjunction with a sextant and a nautical almanac, the Lindbergh Hour Angle watch – based on the model Weems created in 1927 – helps aviators calculate longitude which, when combined with their latitude, gives them their exact geographical situation. 1936- The factory creates a calibre for a legendary wristwatch, the 13ZN, produced in various versions, with one or two push-pieces, with a semi-instantaneous 30-minute counter or a 60-minute continuous counter. Longines files a patent for this calibre, one of the most remarkable in its history. 1939- Longines, basing its research on a 24-line calibre, develops mechanical timekeeping equipment, including a chronograph with a semi-instantaneous 30-minute counter and a flyback hand, a semi-instantaneous sports counter with or without flyback hand, and another counter accurate to a hundredth of a second. 1945- Longines launches its first self-winding movement, the patented calibre 22A. The development of this prototype represents a major challenge for the company, which for the first time adapts the new winding technology for large-scale production. 1947- The technical office develops a new hand-wound mechanical movement with a chronograph function, the 30CH. 1954- Longines develops its first quartz clock, which will quickly chalk up an impressive new series of records for accuracy at the Neuchâtel Observatory. The timekeeping instrument, Chronocinégines, includes a 16 mm camera attached to a quartz clock. It provides sports officials with a filmed tape showing a series of still images taken every hundredth of a second, allowing them to follow the athletes’ movements as they pass the finishing line. 1957- After Conquest, the elegant Flagship collection is launched, with its distinctive medallion featuring a caravel engraved on the case back. 1959- Longines develops a calibre specifically intended for observatory competitions: the 360. The generous size of the rectangular movement houses a large barrel spring and enables the use of a wide sprung balance, oscillating at a frequency of 36,000 vibrations per hour, for even greater accuracy. The 360 calibre sets new records for accuracy in the wristwatch category at the Neuchâtel Observatory. 1963- Wishing to assess the options offered by technologies beyond traditional watchmaking, Longines designs an electromechanical calibre intended for observatory competitions and powered by a 1.35 V mercury battery: the L400 movement. 1964- With the aid of its Chronocinégines (the timekeeping instrument created by the company in 1954), Longines times Donald Campbell aboard his high-speed Bluebird II car as it races across Lake Eyre in Australia on its way to setting a world land speed record of 648.565 km/h. 1965- Research conducted by Longines on electronic and quartz technology enable it to develop an electronic quartz movement, the 800 calibre, for on-board chronometers. This time-measuring device opens the way to new heights of accuracy. It easily outstrips the records set by mechanical devices in observatories. 1967- Longines launches a self-winding 11½-line calibre, aiming to offer an alternative to the electronics and quartz used by the competition. The regulating organ of the L430 movement is a guarantee of accuracy, with the characteristics of a competition piece, as it vibrates at a frequency of 36,000 vibrations per hour. The Ultra-Chron collection is based around it. 1969- The top-secret Project Hourglass, the aim of which was to design and manufacture a quartz watch, is revived in 1969 when Longines launches the first cybernetic quartz calibre for a wristwatch, the L6512, named Ultra-Quartz. 1972- Produced in collaboration with Ebauche SA and Texas Instruments Incorporated, the Longines LCD (Liquid Crystal Display) is the first digital watch created by the brand. It receives the important IR100 award (Annual Industrial Research Conference and Awards). 1975- The Saint-Imier brand wins a prize for a timepiece named Cleopatra, inspired by Eastern styles on a ‘slave’-type bracelet. It wins a Golden Rose of Baden-Baden. 1977- The factory develops a mechanical self-winding calibre, the L990, with two barrels placed on the same level. With a height of only 2.95 mm, it is the world’s flattest self-winding movement of its kind. At a time when quartz is dominating the output of many watchmakers, it strengthens Longines’ range of mechanical movements. 1979- Longines presents a quartz watch that is only 1.98 mm thick. The first timepiece to break the 2 mm barrier, its extremely slender calibre is the result of the development of specific technology. Named Feuille d’Or (‘Gold Leaf’), this watch is a wonder of technological achievement. 1982- The brand with the winged hourglass logo launches the Agassiz line in 18-carat gold: classic, ultra-thin watches that will lead to the development of Longines’ La Grande Classique, an emblematic collection which proves an immediate and enduring success. 1983- Longines becomes part of Société Suisse de Microélectronique et d’Horlogerie (SMH), now renamed Swatch Group, the world watchmaking leader founded by Nicolas G. Hayek. 1984- The company launches the 276 VHP (Very High Precision) calibre, a quartz movement of very high precision equipped with a technology that neutralises the effects of temperature variations. This movement is used in the watches of the Conquest collection. 1985- Longines is named official timekeeper for all the artistic and rhythmic gymnastics events organised by the International Federation of Gymnastics (IFG). 1992- To celebrate the 160th anniversary of its existence and 125 years of the use of its brand name and logo, Nicolas G. Hayek, founder and president of Swatch Group, and Walter von Känel, president of Longines, inaugurate the Longines Museum at the company’s headquarters in Saint-Imier, with a gallery retracing the company’s history. 1997- Longines creates the Longines DolceVita collection, a line expressing contemporary aesthetics which meets with great success due to its modern reinterpretation of watchmaking elegance. This range is a particular hit with younger consumers and brings a touch of class to feminine wrists. 1999- Adoption of the slogan ‘Elegance is an attitude’, which references Longines’ devotion to elegance in all things: not only appearances, but acts and behaviour as well. 2003- Longines creates the Longines evidenza collection of barrel-shaped watches which demonstrate the affirmation of elegance, style and tradition. 2005- As global trends show a renewed preference for mechanical movements, Longines introduces a collection intended to perpetuate its long watchmaking tradition. The Longines Master Collection is composed entirely of models with mechanical movements, most of which are self-winding. 2007- Launch of the Longines Sport Collection, specially developed to perpetuate the brand’s ability to produce timepieces designed to meet the particular needs of sportspeople without sacrificing elegance.The collection is made up of four different lines: HydroConquest, Conquest, GrandeVitesse and Admiral. 2009- Aware that its recent developments have somewhat neglected the feminine wrist, Longines fills this gap by launching the Longines PrimaLuna collection, devoted entirely to women. 2010- Longines presents a new column wheel chronograph movement, the L688. This prestigious, self-winding mechanical calibre is used in particular for the watches of the Longines Saint-Imier Collection, launched in 2012. 2011- Longines presents the Longines Master Collection Retrograde Moonphase model. It has an L707 movement (exclusive to Longines) displaying four retrograde functions (day, date, second, 24-hour scale), the phases of the moon and a day/night indicator. 2012- Launch of the Longines Saint-Imier Collection, a tribute to the village where the company was born and where it still remains today. This collection is made up of watches moved by some of the brand’s most prestigious mechanical calibres and is inspired by both its heritage of watchmaking know-how and its roots. A collection that remains faithful to the Longines values: tradition, elegance, quality and accuracy. 2013- The International Equestrian Federation (FEI) and Longines sign a partnership agreement whereby the watch brand is appointed top partner of the FEI. The President of the FEI, Her Royal Highness Princess Haya, and Nayla Hayek, President of the Administrative Board of the Swatch Group, both sign the contract. Longines is now the official timekeeper and the official watch for the FEI. On the strength of its rich history, illustrated in particular by the incredible feats of the first aviators, Longines presents the Longines Avigation Oversize Crown model, a watch in the brand’s line of special aviation timepieces created to meet the needs of pilots.This creation, fitted with a mechanical, self-winding movement, is available in three versions, all in steel. The simple version (hours, minutes, seconds and date) is complemented by a model with a second time-zone and a single push-piece chronograph, fitted with the exclusive L788 movement. 2014- Longines celebrates the year of the horse by launching a pocket watch in rose gold: the Longines Equestrian Lepine. The back of this exceptional piece is adorned with a horse jumping an obstacle and its inspiration was drawn from a metal Lépine pocket watch dating from 1927 and kept at the Longines Museum in Saint-Imier (BE). 2015- Longines today unveils a game-changing development for timekeeping and tracking technology in horseracing: the Longines Positioning System (LPS). This system provides instant data on the exact position of horses during a race, race rankings, the distance between horses and speed. It boasts accuracy down to 5 centimetres and features up to 1,000 measurements per second.